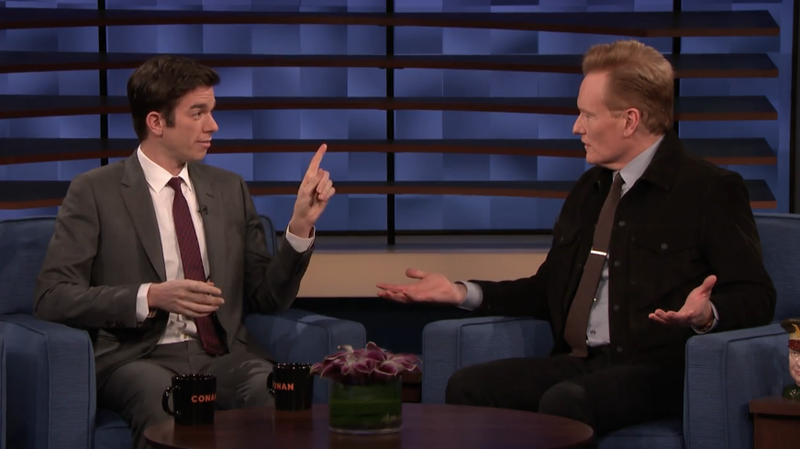 As far as spectacularly failed sitcom stars go, John Mulaney is killing it these days. Winning Emmys for his consistently killer stand-up specials, voicing the hilariously awkward Andrew Glouberman on Big Mouth, penning arguably the best Documentary Now! episode of the season, and being plain delightful on talk shows are all fine, but Mulaney’s also garnered a measure of good-natured revenge in the process. No, not on the people who didn’t like Mulaney. They were pretty much on the money there. But at his old gig, Saturday Night Live, where the former writer has now not only hosted twice, to wide acclaim, but has also used his newfound clout to resurrect a pair of old, rejected sketches that completely murdered on-air and in the all-important video virality arena. So, what do you think of him now, Lorne Michaels? As to what grubby detail of live in New York Mulaney might have tucked away in his “I’ll show you, Lorne Michaels” file, Conan asked if there’s a third such can’t-miss musical extravaganza in store. And while Mulaney noted that he hasn’t actually been booked to host SNL for a third time as yet, he did suggest that the city’s infamously troubled subway system seems a perfect candidate. Noting that the Brooklyn-to-Queens G train has only about three cars, arrives according to its own stubbornly unpredictable schedule, and always boasts one seat “with a little level of soda sitting in it,” Mulaney hinted at a possible conclusion to his overlooked, gross New York sketch trilogy.